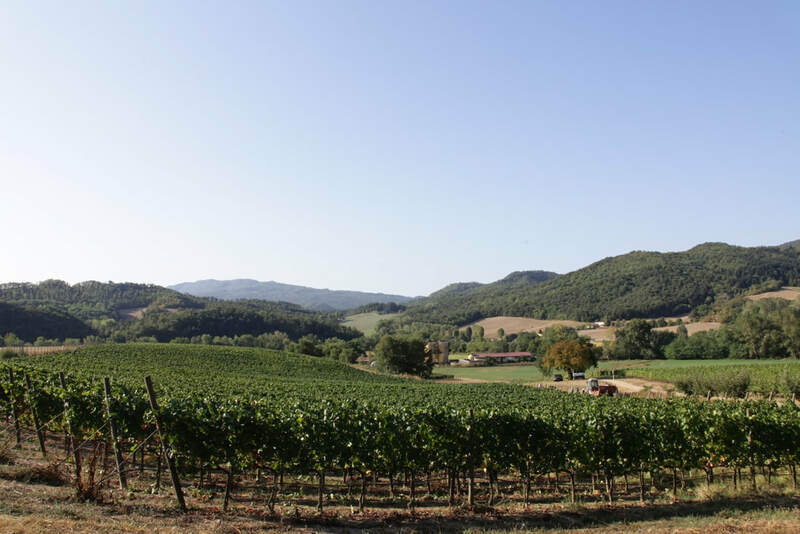 Podere Fortuna is situated 25 kilometers north of Florence in the heart of Tuscany among the beautiful hills of the Mugello valley. This part of the region forms a large natural amphitheater between the Sieve river and the foot of the Apennines that mark the border between Tuscany and Emilia-Romagna. ​The property extends to 31 hectares and 6 are dedicated to the vineyard. Here we produce mainly Pinot Noir, which is the main grape variety for the great red wines from Burgundy and is regarded as one of the world’s noblest but challenging of grape varieties. We take care of the vineyards following an environmentally friendly way with the goal to have perfect grapes every years but with a long term view. We believe that the great care of the vineyards is essential when working with so challenging vines and is the only way to maintain the finest quality of wines in different vintages. Podere Fortuna was part of Cafaggiolo Castle estate owned by the Medici family that was native of this part of Mugello Valley. The place has been known for excellent wines since Middle Ages and, thanks to the Medicean Archives still available today in Florence, we have found proof of wine making at Podere Fortuna on 1465, when the property was inherited by Lorenzo il Magnifico and his ancient coat of arms featured a red grape on the top of Medici’s emblem. Despite to his 500 years old history during the last 50 years the vineyard was no longer cultivated and just when we bought the estate in 1998 we decided to resume the tradition of wine making in Podere Fortuna. After years of climate and soil studies we made the choice to plant mainly Pinot Noir, which is the main grape variety for the great red wines from Burgundy and is regarded as one of the world’s noblest but challenging of grape varieties. We started planting in 2001 with grapes selected by Pierre Marie Guillaume, whom is based in Burgundy and we planted them at 7,142 vines per hectare. 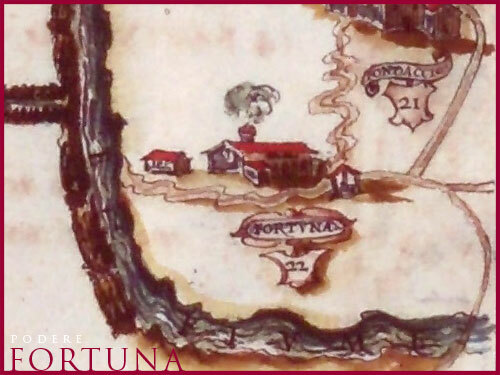 Today Podere Fortuna has two vineyards with their ancient names of Fortuni and Coldaia planted with 31.500 Pinot Noir vines and 1.500 Chardonnay vines (in a parcel of Coldaia called Greto alla Macchia). ​We take care of the vineyards following an environmentally friendly way with the goal to have perfect grapes every years but with a long term view. We don’t use any chemical to control grass growing and the treatments to control fungal diseases if needed are done with low impact products. We believe that the great care of the vineyards is essential when working with so challenging vines and is the only way to maintain the finest quality of wines in different vintages. Pruning as well as shoots selection is done by hand, with a focus on obtaining the best canopy possible, optimal for the vine’s growth and grape ripening. 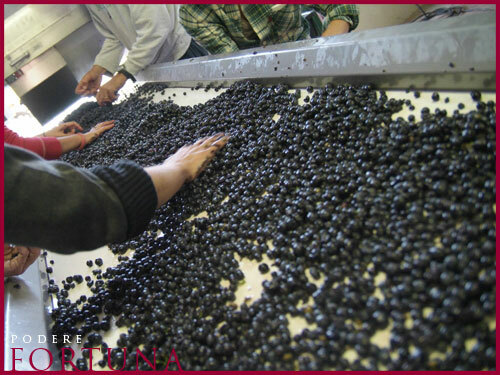 We produce three red wines 100% Pinot Noir and one white wine, a blend of Chardonnay and Pinot Noir. Our property is divided in two vineyards (Fortuni and Coldaia) which have their own character and identity, therefore we harvested, vinify and bottled separately. Our red wine are FORTUNI, COLDAIA and MCDLXV Selection, the first two are single vineyard wines, but the third one, which means 1465 in roman numerals, and is dedicated to PODERE FORTUNA first proved vintage, is our finest wine and it is produced just in the best vintages from grapes selected from a few parcels of the two vineyards.